I love the color! The cushions however, slip and slide all over the place. I will need to consider adding velcro to one side of the cushions and seat to stop this. It was fairly easy to put together once my husband provided me a few tips from his line of work. All the holes lined up, only issue I had was the wicker did cover one hole entirely for the foot but, ehhh. I did not want to risk making my own hole to ruin the tightness of the wicker, so I simply left that screw out and made the other foot screw extra tight, will be fine. Also, from lack of my own research, I was surprised at how low the back is but otherwise is comfy enough for having young kids in and out of the pool the next few years! 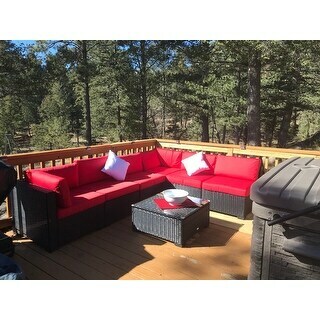 The outdoor sectional sofa set with simple yet sleek outlines is where you could take a rest, luxuriate in sunshine and share your families with ever-lasting joy. The outdoor wicker cushioned sofa is finely crafted to offer a reliable use in the long term as the frame is constructed of rust-resistant steel and the wicker is hand woven in a sophisticated way. Extra support and comfort are added thanks to the thick padded cushions which are also zipped and washable for easy cleaning and maintenance. Versatile and functional, the wicker sofa set featuring roomy space can be served as sectional sofas, conversational sets and the chaise lounge, suitable for patio, pool, deck, garden, balcony, etc. You’re assured to be amazed at how wonderful the break time could be brought up to you and your families with the patio sofa set. Diversified Combination: The patio furniture set features 2 corner seat and 4 single seat, which you can mix freely according to the number of people in different scenes. 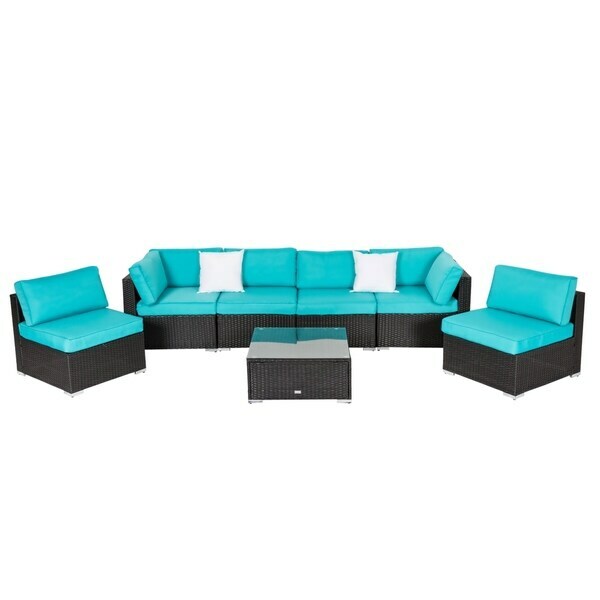 The sectional is beautiful and the price was unbeatable !! Very comfy !! The set was nicely packed in 4 cartons, shrink wrapped, and banded on a pallet.I researched weeks.. I am very particular when buying expensive products.. I found many comparable products but was specifically looking for two things, the back height and the warranty! The team at Ohana was amazing, I ordered directly from their website for a better price and put faith into their team to make sure. I upgraded to the sunbrella taupe color on black wicker. I made sure to contact them before ordering to make sure nothing went wrong with shipment and delivery of product.. this was a large investment and wanted to make 100% sure I did not need to ship it back to them.. After about 2-3 weeks I unexpectedly got a cal that shipment was ready for delivery with 2 days after shipping, it was here the next day.. it was like Christmas for my wife.. this set was packed so nicely I was super impressed, nothing ever comes in one piece without damage.. I took pictures of delivery, the freight guy was very patient and allowed me to inspect all boxes to make sure nothing was wrong.. Once we assembled the pieces, they went to gether literally in minutes.. the most unfortunate thing was that we had a tornado warning that afternoon and paranoia set in heavy because these prices are NOT heavy at all. The wind was thrashing them around like play toys.. I will advise on options later.. The cushions were very impressive, the quality is apparent with the Velcro attachments, they fit like a glove.. The cover is a perfect fit as well. We are extremely please and excited. We have spent more time outside watching the Stanley cup playoffs, GO PENS! And entertaining our friends. We continue to get complements.. Now here is a few peices of advise.. the wind will not behave with these and you will NOT keep these in one place, the cover will flap in the wind like a sail and the these will get damaged 100%.. What we did was, I secured 25lb bench press weight underneath each seat on the main 4 piece couch using thick clothing line against the bottom frame.. I added 10lb weight to the two additional seats which we move often to cover during rainy night.. this added total of 120 lbs additional to the sectional.. I also using thick black zip ties to secure the 4 pieces together at the bottom, the clips provided were ok but they were not secure enough.. We literally do not want this to move more than an inch in the wind.. we live up on a Hill exposed to high winds. 40-50mph sometimes.. The cover is also an issue of not secured.. what I did was added grommets to the corners and middle on the longer side to secure it safely behind the couch and then easily rolled up when not in use. I added 25lb weight under the table as well.. Each carton contained 2 units plus the cushions, and were also wrapped in protective coverings. The glass table top was wrapped inside 2 sheets of Styrofoam, and had protective clips on all four corners. The pieces are very light weight, so moving them is easy. I do not know how to upload picture but the only diffrence from the picture is I purchased the red set. We are very happy with the investment made !! Nice quality! Loved the color! I was worried about the putting together part after reading all the reviews but I found it was fairly easy as long as you have power tools and don’t depend on the ones they sent with it. I think the instructions might be confusing because it’s basically instructions to put a sofa together not each piece. You just have to have have a little common sense. Love the quality of both the wicker pieces and the cushions. The color of the cushions is very true to the website photos. Assembly was time consuming but this is a big sofa sectional so that was expected. I would definitely recommend this set. We LOVE this set! The color is perfect for our yard and even after being wet from the pool, the fabric doesn't discolor after sitting on it. The glass piece on the table is an excellent addition to the set. I ordered the red set and really it. The red is vivid and the wicker seems to be quite thick and sturdy. The back of the furniture is low but i still find it comfortable to sit and relax on. The only negative that I have is that it took a long time to put this set together; there are many pieces that need screws and nuts. After it was finally put together I have to say that it is stunning. This set was a good value for the money. There were and are a few draw backs that would cause me not to buy it again. This took me a long time to put together and of course the assembly was monotonous. Granted the parts were marked very well and there were extras in the way of hardware so with that I was pleased. I thought this would be a simple and fun couples project but one of us got bored quickly and quit and then it became an assemble on my own project over a span of hours. Probably four. The right tools made it easier but still time consuming. Now for the current and ongoing issues. It is very sturdy and well made but the waterproof cushions slide everywhere. We will be adding an adhesive to make them stay but then they will no longer be reversible. I am only 5'6" tall and even though the seat depth is great the backs are still disappointing low. Again, great set for the money. Looks and presentation as well as sturdiness are exceptional. In comfort it lacks. We really wanted to lounge when we purchased this and it just leaves us wanting in that area. I would have bought something else if I had tried it before I purchased it. We considered buying the loveseat so we could have two more corners but reconsidered because this will not be our forever furniture poolside. Again, if you want it for looks, it is a 5. Versatility, also a 5. Comfort drops to a 2 or 3 at best. I really like this set of outdoor furniture- it looks exactly like the picture shows. I picked the red set and it is a very pretty red. My only complaint is that after reading the reviews, people said they put this together in a 1 1/2-2 hours. I say BALONEY-it took by husband and I almost FIVE hours to put this together. The tools they send are cheap and do not work well. We had to use channel locks to pull some of the pieces together to get the screws to catch. It really wasn't hard per se, but very time consuming. Also, you definitely need to get some heavy duty Velcro for the cushions, they will not stay on. This is a great sectional. However, there were numerous places where the wicker was broken and the table arrived with a bent leg. It did take a long time to put together as others have mentioned, even with my power tools. Otherwise, comfortable, great fabric and value. I would still recommend this to others. Instructions included in the package were for a sofa and not the sectional as shown. I first thought the order was incorrect. But after laying out the pieces everything checked out. It took around five hours to assemble. Once assembled, it was as nice as pictured. I did contact customer service when I thought the order was incorrect. I spoke to Chris who was extremely helpful. Their Customer Service Departure is great. I will order from Overstock in the future! Thanks again Chris! This furniture has been a great choice. I hosted our large family Easter at my home and received several compliments on the furniture's quality, comfort and color. Would definitely purchase again. Great price! I looked for a long time and took the plunge and glad I did. Yes, it was time-consuming to assemble, as other reviews have said, ( use your own tools, if you can), but well worth the end results! Most impressed with the service from overstock— I had a broken piece, was ready with pictures to show them, but they are quickly sending me a new piece with no issues— fast, courteous and great service! I have the couch in an “L “ shape now, but love the fact I have so many options with this modular setting , comfy, well made and looks great! Arrived in 4 boxes. Each in good condition. Sectional worked well on my porch space. Assembly was a bit challenging but the results were very nice and comfortable. 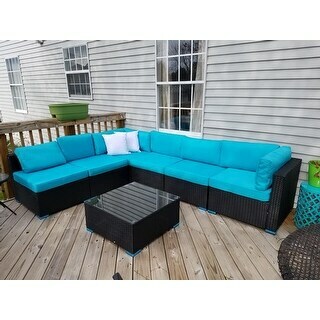 I love this furniture and think it is beautiful on my back deck. The blue color is gorgeous. It arrived in 4 well packaged boxes. One of the boxes had a big hole in it but all of the pieces were intact and not damaged. I thought the price was very reasonable. I comparison shopped for months before deciding to go with this set. The only reason I gave it four stars is because my husband said it was a pain to put together. He spent a few hours working on it. Otherwise, great purchase and beautiful furniture. I would definitely recommend it. Just be prepared to spend a few hours putting all the pieces together before you can enjoy it. So far so good. Looks sturdy and pretty on my deck. The real looks so beautiful Cant wait for the summer parties to start. Lots more room for guests. We love the quality of the furniture and the cushions.The assembly took a while but was well worth it! This product was manufactured by abject misanthropes who clearly believe people who shop at Ikea do so only because they are lazy and want their furniture assembly process to be quick and painless. "are the cushions water resistant?" It is water resistant for drinks spill but not for heavy rains. "what is the thickness.of the cushion seats for the kinbor 7 piece sectional?" The thickness of the seat cushion is 4.5". Price and reviews on the product were good. "Is this blue or turquoise. 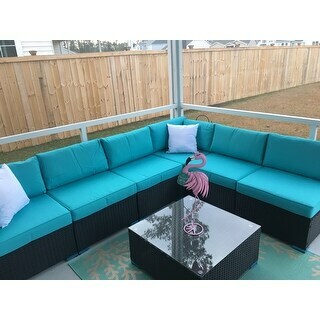 It looks like turquoise, I'm wanting turquoise not blue Thank you"
The color for the 7 piece wicker sofa set you mentioned is blue.